At last the ground is white and Aron can enjoy the Winter time. For the time being he swims less, just plays on the soft white snow. One day I saw him playing with a simple short hose. It was really a great pleasure to watch – he was so adorable! 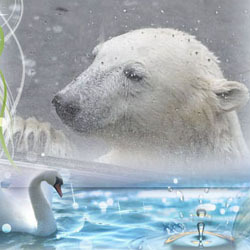 Aron is a very playful Polar Bear and he delights by every new interesting toy. Unfortunately, all the plastic toys are not strong enough in the cold time, especially if a quite big Polar Bear Boy will test them! This cone was broken very quickly. Anyway, playing with it was a great fun for ARON! Mother Friida looks always happy, if Aron Boy feels good. They also often play together, too, but it seems to me, that Aron is not very interested in this playing every time and, of course, he is too strong already for some kind of games with his mother. After a day with active playing a nice nap is needed. One can’t but love this sweet polar bear boy! Aron certainly is a cute and most lovable polar bear boy. I’m so glad there’s snow now in Tallinn so he can enjoy the white stuff with his mama Friida. Rolling in the snow with a toy is so fun and your photos really show us a happy bear. Aron standing on his hind legs holding the cone looks soooo adorable! But, of course, he looks lovely what ever he’s doing – on the ground or in the water. Friida must be very proud of his son and with all reason! The close-ups of the sleeping Aron are ever so cute. No wonder he was tired after a very active playing session. Thank you so much for this charming article with great photos and videos! I wish you and ‘your polar bears’ a wonderful February! Thank you for the nice report from Tallin. for a very active bearboy, named Aron ! Frida is a beautiful lady. She is proud of her son. Spielsachen. Sein schönes Spiel mit dem Rohr auf dem Kopf erinnert an das leidenschaftliche Spiel von Milak in Aalborg mit seiner Röhre. Vielen Dank für deine Erzählungen und die wunderbaren Fotos und Videos der Bären im winterlichen Tallinn! Thank you for your affectionate report and the wonderful pics and videos of Friida and Aaron. It´s quite understandable that you fell in love with this charming and goodlooking polar bear boy since he presents himself so playful, fun-loving and enterprising. You took marvellous photos! One of my favourites is the third one on which Aaron is playing with the hose. I love to watch polar bears exploring a tube or a cone! It is so funny when they put their noses or even their whole heads into it. Pretty Friida could be proud of her son for many reasons! ich kann mich den Kommentaren meiner Vorschreiber/Innen nur anschließen. Das sind wunderbare Bilder von Aron und seiner Mama Frida. Herrlich wie Aron mit dem Schlauch, aber auch mit der Pylone spielt. Leider hatten wir dieses Jahr so gut wie kein Schnee in Berlin. Schade. Aron has grown into an impressive male Polar Bear. Mother Friida is very brave to still wrestle with him. Breaking toys is the best fun for Polar Bears. Thank you so much for the pictures and account. It is wonderful to watch your sweet pictures and your adorable videos. Thank you, dear All, who took some time for reading and commenting this story! I can only agree with you: Aron really has grown into an impressive male Polar Bear and he looks lovely what ever he’s doing – on the ground or in the water. Of course, Mother Friida looks beautiful and she can be proud of his lovely Son. My special thanks to you, Mervi!